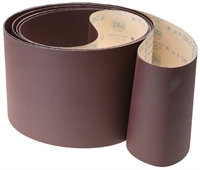 Applications: These belts are for wide belt sanding machines. They are in the finer grades for final cleaning, smoothing and fine grain finishing of sheet materials. Product Notes: KP947F Has an F weight paper backing, giving optimum stiffness and strength, whilst allowing adequate flexibility for correct operation. It uses a high purity aluminium oxide abrasive which is suitable for most metals, as well as wood. Also Available: For coarser grades, please see KP949 belt options. If you don't see your size here, please enquire.